We are still waiting for most of Windows 8 Tablets. Actually, for the 26th October appear over 20 Windows 8 Tablet with Intel processors - that was not so. Gradually, but are now more devices come to market and below is also the Lenovo ThinkPad Tablet 2 . 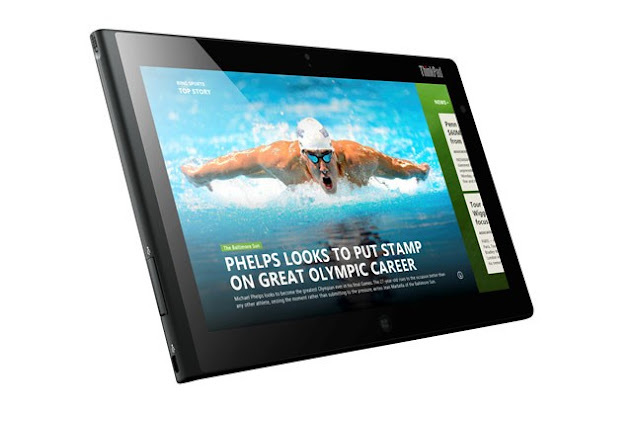 Several German retailers have now confirmed that the ThinkPad Tablet 2 in the week will be available before Christmas. This is the week of 17 to 23 December, so in two weeks. In Germany, the cheapest version of the tablet will cost 629 euros. The Lenovo ThinkPad Tablet 2, with a 10.1 inch IPS display that has a resolution of 1366 × 768 pixels. This resolution, most have Windows 8 Tablets. On the ThinkPad Tablet 2 Windows preinstalled 8 Pro, because the device is an Intel Atom Clover Trail processor with 2GB of RAM. The same chip is also in the Acer Iconia Tab W510 to find. Depending on the model you will get the ThinkPad Tablet 2 with 32GB or 64GB memory. At the sides of the tablet has a full USB 2.0 port, a mini HDMI output and a microSD card reader. There are numerous accessories like a keyboard dock and stylus, because you can get the ThinkPad Tablet 2 with an active digitizer.